Harriers-Online / 23-11-2006 / Hello, hello, hello. What have we here then? Date: 23-11-06 Hello, hello, hello. What have we here then? The Harriers welcomed a special Constable to Aggborough today with the loan signing of James Constable from neighbours Walsall. Here for a two month period, that will take him almost to the end of January, the twenty two year old striker was signed from Chippenham Town last season and originally blazed onto the scene at the Bescot but this season has struggled to make the first team on a number of occasions. With the return of Reuben Reid to Plymouth Constable should step straight into the side in his place. It will probably make Andy White wonder what he has to do to get a place in the starting line-up and not spending 75% of a game sat on the bench. 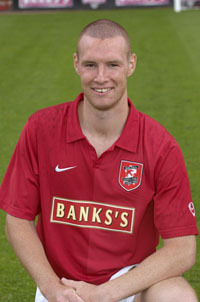 Constable has made twenty nine appearances for the Saddlers so far and scored five goals in the process. He'll go straight into the side that faces Stevenage on Saturday. In other news from the club it appears that Dean Sturridge's time at the club is over before it ever really started. There are grave fears that the ankle injury that he collected against Tamworth in September will not get any better and he'll have to retire from the game. Now thirty three years old it's felt that his fitness levels will not be high enough for the pressure of the Conference.